The PM said it was "highly likely" Russia was responsible for the Salisbury attack. The Foreign Office summoned Russia's ambassador to provide an explanation. 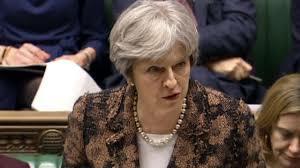 Mrs May said if there is no "credible response" by the end of Tuesday, the UK would conclude there has been an "unlawful use of force" by Moscow. Mrs May said: "Either this was a direct action by the Russian state against our country, or the Russian government lost control of its potentially catastrophically damaging nerve agent and allowed it to get into the hands of others." She said Foreign Secretary Boris Johnson had told the ambassador Moscow must provide "full and complete disclosure" of the Novichok programme to the Organisation for the Prohibition of Chemical Weapons.